He has had a celebratory candle created in his name; a statue of him built from Legos — accurate down to the tattoos; and a corn maze in Sterling cut to resemble him striking a signature pose. Greg Skomal, a biologist for the state’s Division of Marine Fisheries, tagged the roughly 15-foot male great white on Sept. 9, during an ocean excursion with the nonprofit Atlantic White Shark Conservancy. Researchers from the conservancy announced Saturday that they had decided to name the ocean predator after the local sports legend. “Go Sox!,” the conservancy wrote on its Facebook page. The post included a picture of the shark’s pointy head, and beady eyes. 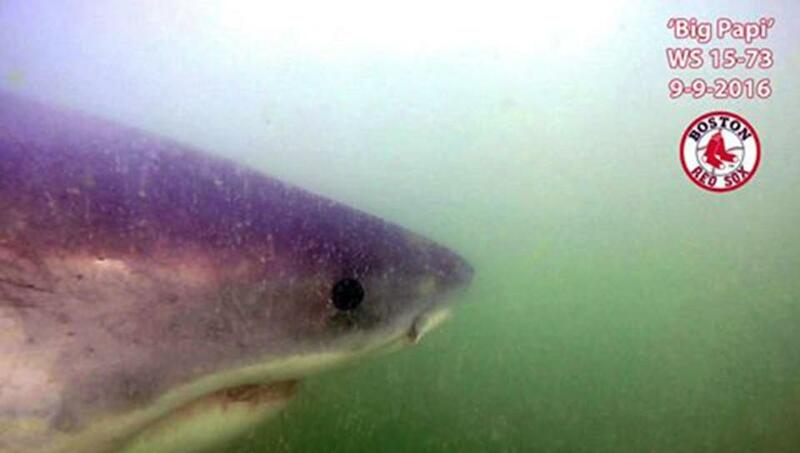 Skomal tagged the shark off the coast of Wellfleet, near the Truro line. It’s been a busy few months for Skomal and shark experts from the nonprofit group. “Big Papi” is one of 19 sharks tagged off Cape Cod coast since the start of the summer.